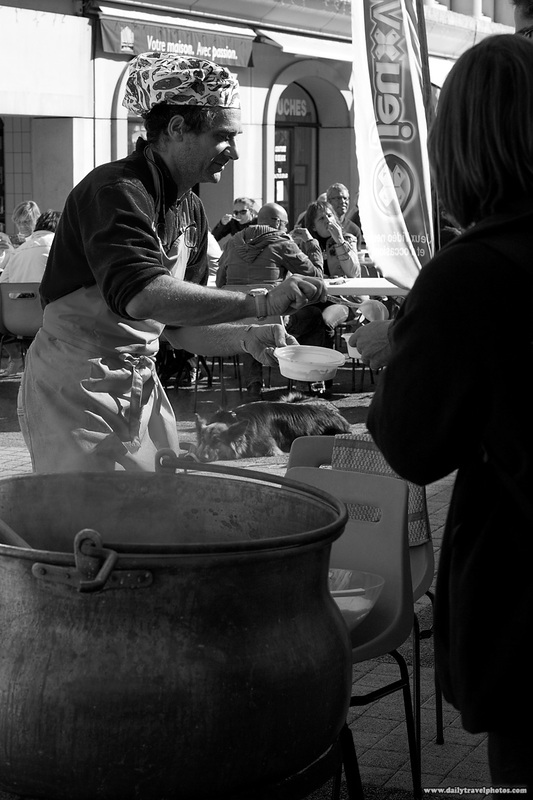 A cook ladles soup made in a comically giant cauldron in Albertville, France. The reason I was in Albertville was the annual Grand Bivouac, a festival for travelers by travelers. At the festival, there are travel documentary and film screenings as well as talks and exhibits shown by some extreme voyagers who, often times, live or travel in harsh and unforgiving circumstances during their trip abroad. Unfortunately, all the talks are given in French, hence, I was unable to attend any of them but I did enjoy the ambiance of being among like-minded international travelers. For the record, I had a bowl of the soup and yes, it was quite chunky and warming on a cold autumn day. Have you ever thought about writing travel essays? It seems like it was a fantastic day in France. The pictures is great. I think you enjoyed your time there because it is so cool to meet knew people all over the world and they can leave best review in your blog. This picture covering so many emotion, that's cool.Thanks for this. Hello! Hope you are doing well. This sire in incredible. I found here so many interesting photos and ideas. No doubt you are doing hard work here. I get to see more cool photos from you in future. Do not hesitate to use www.custom-paper-writing.org to be sure in high quality all of your new posts!